A huge crack of thunder jumped me out of bed in time to see the lightning strike. 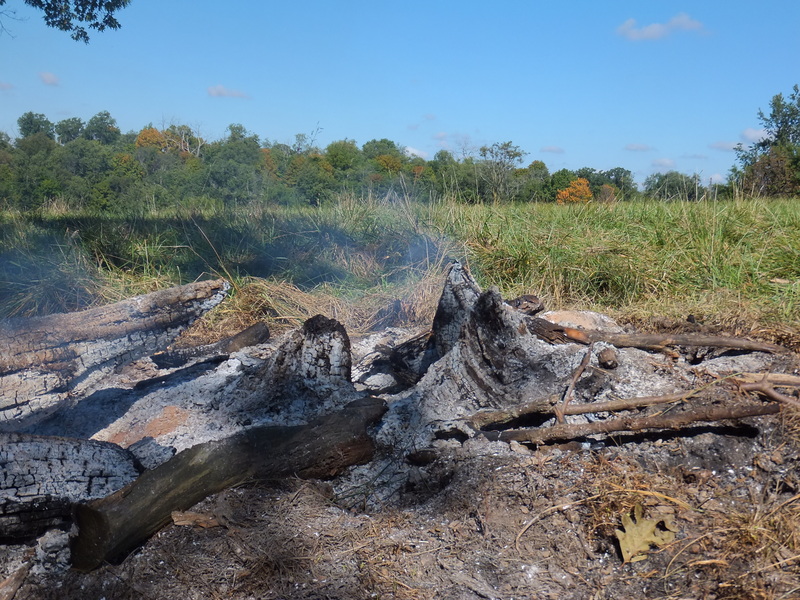 That afternoon I saw a ton of white smoke coming from what looked like my pasture, but I knew it couldn’t be my pasture as I hadn’t started a fire and my boys don’t start fires on their own. It started to rain again before I had a chance to check it out. The next day I finally had a chance to check it out and to my surprise I found most of an old dead elm tree burnt up. I have a healthy respect, (fear), for lightning. My Dad taught me to seek shelter whenever a thunderstorm approached. One time, shortly after sitting down in the kitchen, we jumped as lightning struck and killed a cow in the front pasture. Examining the cow shortly after the storm passed showed signs of electrocution. The hair was burnt off the insides of her legs and her udder. Her rumen was distended and hard. And most amazing to me, she was already hard with rigor mortis. Rigor mortis is caused by the depletion of adenosine triphosphate, (ATP). ATP is how energy is transferred within cells. When an animal dies, ATP is depleted and results in muscles contracting and staying contracted until the carcass begins to break down. Rigor mortis usually begins after three or four hours and peaks at about twelve hours. The difference in the case of electrocution by lightning is ATP is burned up by electricity, so rigor mortis occurs immediately. I’d also like to put to rest the fallacy that lightning doesn’t strike in the same place twice. The gates into my parents’ yard were hung on two large wooden posts. One of the posts was struck once, the other post was struck twice by lightning in about twenty years. We think have an idea why lightning was attracted to the area as under the gravel of the road was a metal grate which ran from one post to the other. Fifteen years ago they removed the metal grating, and the posts haven’t been struck since. It’s still invigorating to open the gates as a storm approaches, though. This entry was posted on Sunday, September 22nd, 2013 at 8:26 pm and is filed under Curious weather. You can follow any responses to this entry through the RSS 2.0 feed. You can leave a response, or trackback from your own site.